100tw Nankang AR-1, 245/40/15 - Miata Turbo Forum - Boost cars, acquire cats. Available outside the US as 80tw already. Coming to the US as 100tw, "soon" according to Nankang Motorsports. Probably through R Compound USA, at least. I know nothing else about their dealer network or anything. Their size chart doesn't even list the 225/45 or 245/40, but they're showing up on cars in EU and being tested here in socal. These look very interesting. I actually ran one of the first batch of AR1s back at the start of 2016 in 195/50R15 on a 7J with the Supermiata race alignment settings. Were ridiculous as stickers, good for the next 10 or so heat cycles then became increasingly difficult to switch on. In the end, I couldn't kill them and removed them just due to the heat cycles but all still had more than 2mm tread all over. To replace them I went with AD08Rs in the same size, seemingly the stock engine heavy NB2 didn't have enough power (especially torque) to maintain slip angles with the AR1s and I prefer that car with the lower grip AD08Rs. Slight aside, but they had comedy levels of low grip in low temps with a few heat cycles when driving from the track but fine when new. I also tried them in 225/40R18 on an 8J on a standard Renault Megane R26 (ie almost no camber, 230hp, 1350kg FWD car with LSD). 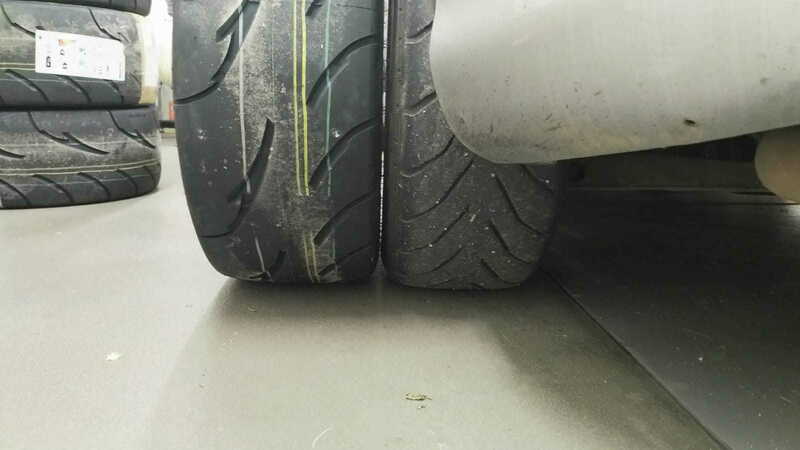 Here they were very disappointing, barely any more grip than Michelin Pilot Super Sports and an axial tread split formed on day one, though never seemed to be an issue. The pyrometer readings obviously had the wrong gradient due to barely any camber, but they weren't as bad as the grip levels suggested. I bought another set of 205/50R15 at the start of last year to run on 8s on my turbo track miata, but the 225/45R15 and 245/40R15 came out before I finished building the car so I bought some 9s. In the end, the huge European cost of these meant I bought a set of 225/45R15 Federal RS-RR and was very disappointed in the grip, so will likely replace with AR1s shortly. 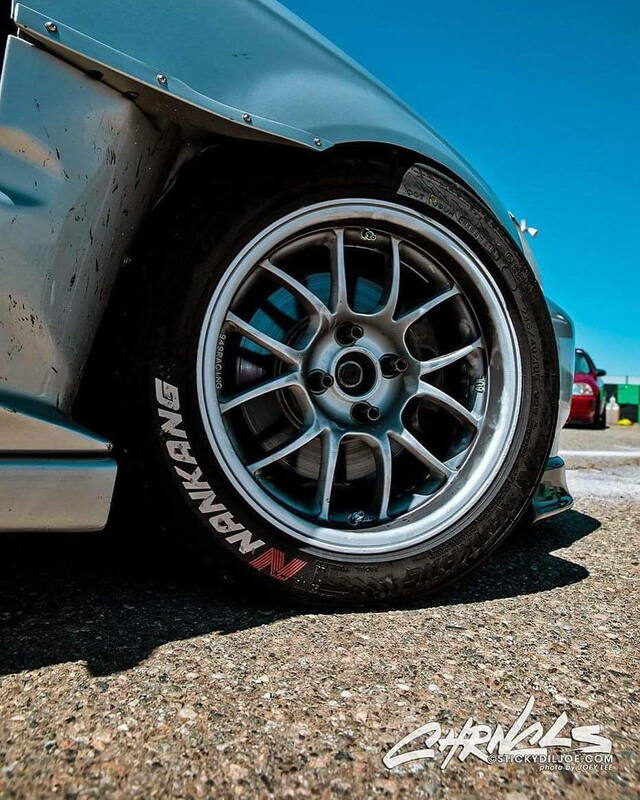 Pro Track Wheels has fitment photos of these mounted on various rim widths on Instagram. It looks like 225/45R15 has a fair amount of stretch on a 9J. 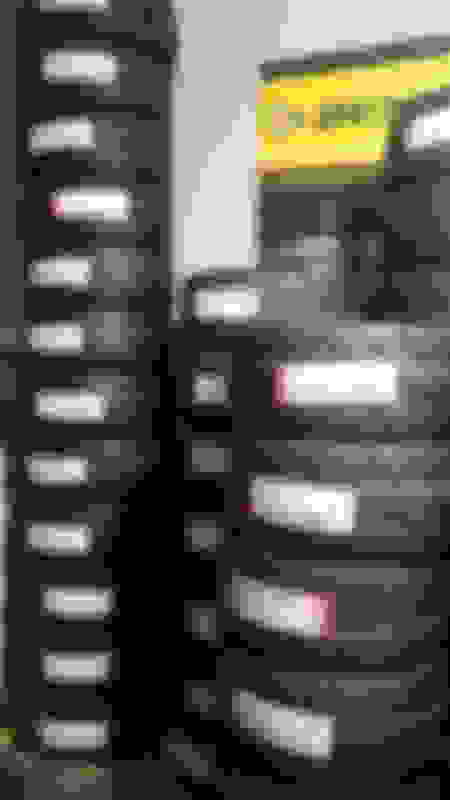 The quoted section width of the 225s isn't much more than the 205s, but the 245s are relatively fatter according to the sheet. (205 says 214mm, 225 says 225mm, 245 says 248mm). Also, oddly the 245 is lighter than even the 205. My experience is slightly different, bought some 195 AR-1 last October. Sidewalls are very stiff so they work just fine with super low pressures on stock 6J wheels, should be great on wider wheels. I ran them on the street for around 1000km including some 500km road trip (cold and rain), and a few mountain visits at high pace (so maybe 3-4 low intensity heat cycles). They heat decently fast after 5-6 hard corners and I ran them nicely at 1.9 bar with no issues due to the stiff sidewalls (even at 1.6bar they dont fold the sidewall that much so its definitely very nice). I used over 50% of the tread during the 6x 20 minute sessions (4 with passenger), it is now maybe 3mm from the wear marks on the insides. Some other people here have ran them on faster turbo miatas with 225 size, from what I understand everyone kinda agrees that they appear to have similar grip to R888R, seem to warm up a bit faster but also seem to overheat easier. just for comparison. 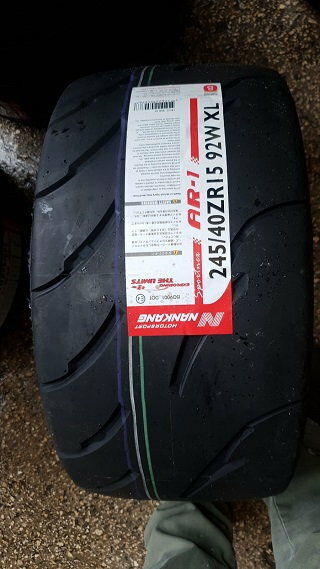 AR-1 225/45 R15 on 15x9 6UL and Avon ZZR 205/50 R15 on Kosei K1 15x7. Haven't tested on track yet. Small update. After another trackday (Estoril), tread wear is much reduced and are still legal to drive on (even the left front (CW tracks)). I think what nashvill said is accurate, as you heat cycle them they will become increasingly hard to kill. That being said they can barely reach 1.1G sustained on a 1100kg NB at basically any speed, and the slip angle is hilarious (but very smooth and telegraphed at least). Highest peak G was usually around 1.2G with some form of trail braking involved. Estoril Circuit has had completely fresh tarmac for a few months with greatly improved grip. The trackday followed a Test Day as well so there was a decent amount of rubber. All in all for the price they are not bad. For a 195 or 205, Federal 595RSR are I think still a better option, AD08R better still. By the time the AR1 are heat cycled out, the AD08R would still be almost like new. The new Federal RS-PRO are also promising but no one here has really tested them. At the 245 price point, it's not bad and they deliver decent performance, considering there really isn't any other choice its a no brainer for high power cars. I wouldn't hesitate to buy them again if the decent pricing continues, but for track use only as the vague feeling, noise and wear are not worth it. On track even after many heat cycles they will last a relatively long time and provide tons of fun in the process. How did you rate the ZZRs? According to some they are quick. Shame that they never combined the ZZS 235-40-15 mould with the ZZR compound. 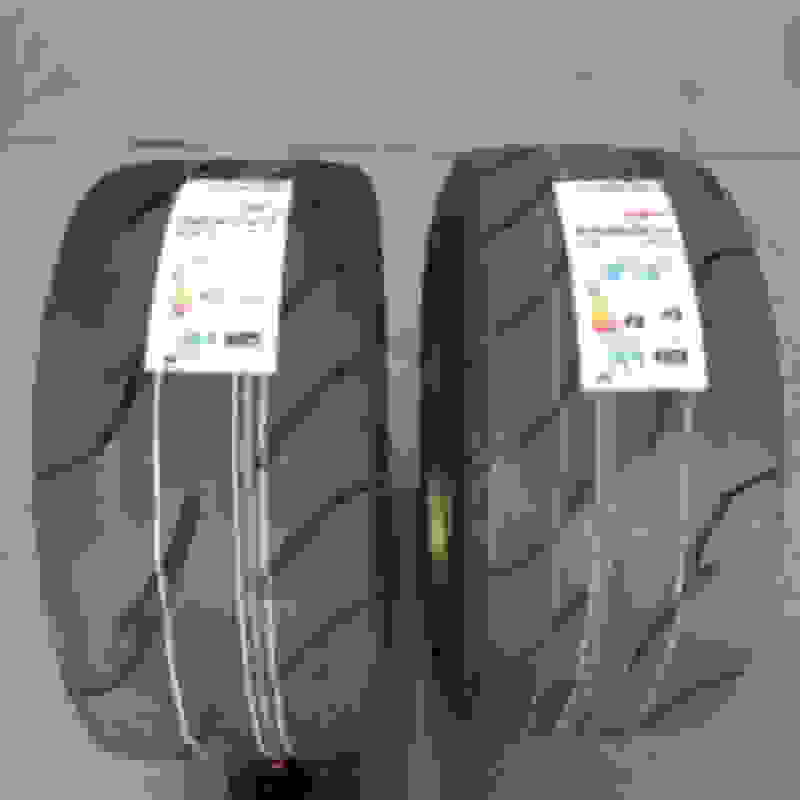 The Australian Rx8 Cup uses these tires. Maybe you can get in touch with Rick Shaw Racing or find them on FB to get some more info. I was mainly driving with R888 205/50, but several years ago Toyo price went up a lot and in my region, so they became in the same price range as ZZR. i can't say anything bad about them(i did manged to get 1 faulty tire which lost/disbonded outside thread). They seem to last maybe slightly longer, but my local track got new tarmac so its hard to tell. 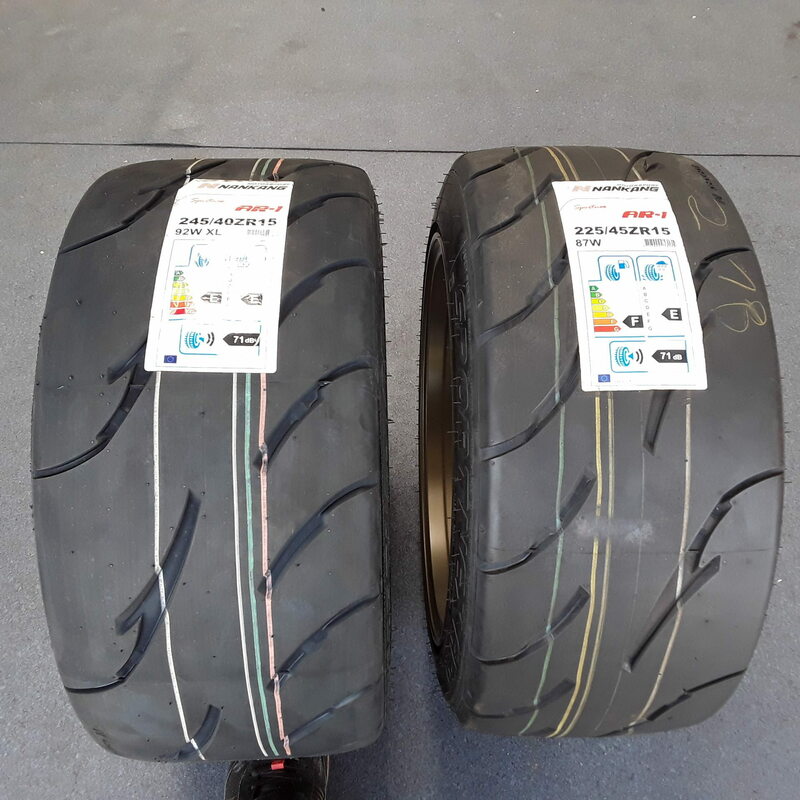 Grip wise was also ok. As R888 used to be best bang for the buck in my region in Europe it was my favourite, but noe when th eprice on toyo/avon is similar its down to personal preference. I did trackdays only- no wheel to wheel. See video posted below. I fail at YT links again. Interesting video. One point to consider is my experience of the 80TW AR1s was that they heatcycled fairly badly, which from what I've read, the RC1 doesn't. Jeez that necro bumping thing is real. Deleted my post from the other thread. I am now in a serious money pit situation with these. Not only it's the first Nankang sport tire in the country, it's the first miata related size in any competitive-size tire (other than stupid 16 oem). What I got from that video was that, if he had driven the Nankangs as he drove the RC1 on the RC1's last hot lap, the Nankang would have won by quite a bit more. The Nankangs had higher braking grip, and higher cornering grip, and yet top speed went to the RC1. It would be really nice to see them do the same test after each set of tires had say 10 heat cycles. New Pics...16x9.5 CCW's Tuckin 245's! Anyone over 300whp using RE71R?